After viewing the medieval bridge at Carhors, France, we passed through San Sebastian and entered into Spain. We went as far south as Seville; a place of immense beauty that I will never forget. We roamed the streets of Seville as if any tourist did. We were in a maze of tiny, city-center streets which were little changed since medieval times. In this part of the old town, I was particularly awed by the cobble street and the architecture on the sides. The horse-drawn carriages and the shadows added to the atmosphere. The color photo below brings my memory back to 1985, the year the trip was made. The yellow wheels of the carriages stand out from the image which otherwise looks quite plain. While the color photo brings back memories of 1985; the sepia below brings back how I felt when I stood in the street taking the picture, surrounded by houses that were built many centuries ago. Again, another journey back in time . . . . . . . . . . . I know as a retiree I now have all the time to go back in time . . . . . . . . . . .
Really lovely shot. I can see why it takes you back. Another beautiful sepia tweek. I’m going to try this with my old photos. Evocative photographs, especially the sepia tone. 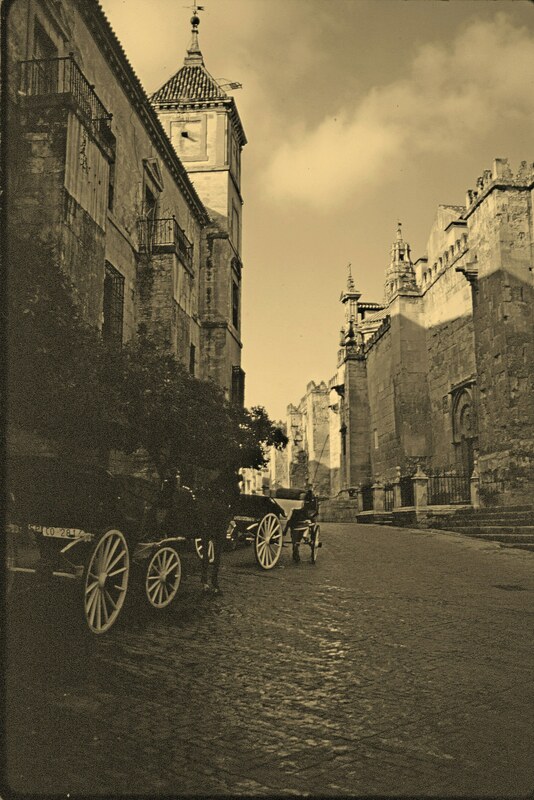 Seville is on my list of places to go. I have been to southern Spain for a 6 week visit and went to the American consulate in Seville but never had a chance to see the city. Northern England is this summer, Spain is next. Even both tones of color are very nice, I like the sepia one a little bit more ^ – ^ feel like I was pulled into the photo, to that long long road ! I can relate to your feelings about being in Spain. I had the same experience when I was there last year. The colored photograph is a lot more interesting than the sepia toned one! Beautiful picture. And the wonderful thing is, Michael, I am sure those streets would be little changed today. Although modern European towns seem sadly to look all the same, those wonderful medieval city and town centres seem to say, “Hands off!” Time you had a return visit methinks! One of my favorite cities …. slightly behind Barcelona. Great shot … have a nice weekend now. Sepia does it again. Nice one. A very different and wonderful photograph of Spain. It is easy to imagine knights in armor riding horses through these streets. It is amazing there are no tv antennas, phone, power, electric lights, etc. 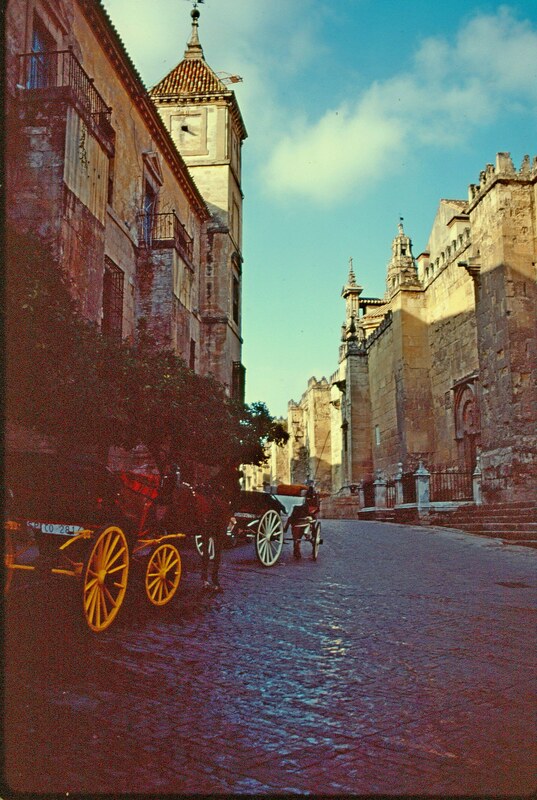 Seville is one of my favorites too in Spain, then Granada, Toledo, Madrid and Barcelona. I’ve been as far as San Sebastian but I like to see more of the north too. The sepia is my favorite. Wow incredible pictures! These photos r older than me but I feel like I live your adventures in them! 1985 would have been shortly after the fall of Franco. I visited in 2000 and still have fond memories. Thanks for bringing them back to the surface! I nominated you for a WordPress Family Blog Award. Here’s the link if you’re interested! So lovely! It looks much like Vigan in Ilocos, Philippines. Beautiful picture..taken in 1985? Can I ask you a technical question? Was that a digital photo, or did you do something to the picture now? You did a very good job in conserving and enhancing the photo! Thanks for telling me your “secret”! These old pictures are beautiful. Both pictures are beautiful, but the sepia one really captures the medieval feel you talked about. I’d love to go there someday! Outstanding photography. I’m yet to visit Seville. Just mentioning the cobblestone streets, one can immediately hear the clickity-clack of horse hooves and the noisy wagon wheels. The beauty and the essence of these elements connects the experiences of the period through the centuries and up through moderninity and the contemporary traveler, be it in person or around the world, individuals viewing through technology, what you have lovingly captured. The essence of these elements, the builders’ art, humanity, and of the loving, meticulous exquisite way of the photographer. Michael, love your photos of España. We usually go to the white villages (Los Pueblos Blancos) of Andalucía because be love to sketch and paint them. Sevilla looks inviting!